07 May Is the pain coming from your Back or …………. your Pelvis?? It might sound crazy, but some people aren’t aware that there are joints in the pelvis, let alone that they can move!! Often pain originating from your pelvis is mistaken for lower back pain. It’s important you understand when it’s your pelvis and not your lower back causing pain – there’s a significant difference and can change treatment dramatically. Did you know that 80% of the population in the Western world suffers from lower back pain. Scary to know, that up to 30% of that which is diagnosed as chronic lower back pain is actually pelvic/ sacroiliac joint generated pain (Hungerford, Gillard & Lee, 2004). The pelvis is an important structure, it connects the legs to the rest of the body. The sacroiliac and pubic symphysis joints connect the bones of the pelvis together. These joints have a massive role in providing stability to the rest of the body from your feet up to your spine (and then the rest). As you can imagine, the pelvis and sacroiliac joints have complex anatomy and biomechanics due to their significance in the body. When the pelvis is involved in pain, it can decrease the effectiveness of your core muscles, so that your core stability is even further compromised, and daily tasks can become very difficult. 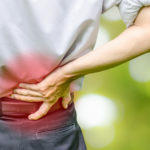 5 signs that it’s your pelvis causing your pain………..
It’s not uncommon for people with symptoms like this to have had Physiotherapy treatment (or Chiro or Osteo) for their lower back and just not improved. This is because the area driving the pain has not been treated. Luckily, the Physiotherapists at Aushealth have completed specialised training to be able to diagnose and treat pelvic- generated pain and can help you get the specific treatment you need to improve! So, If you’re suffering with low back or pelvic pain that you would like to the bottom of, get in touch, we’d love to help you. To make an appointment, call us on 9905 0048 or click here to make an appointment online and get real solutions to your back pain.